Regular visitors of my Islay Pictures photoblog will have noticed that I'm having an (unannounced) Killinallan Beach week at the moment, including Traigh Baile Aonghais from the Dunes and Motorbike on the Beach at Killinallan. 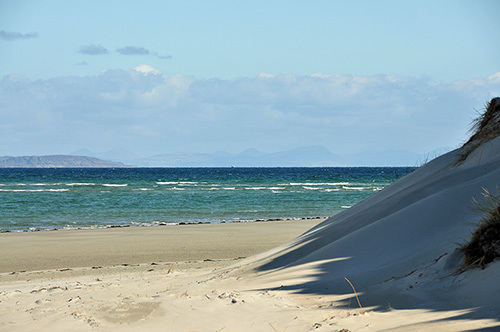 The picture above is right at Killinallan Point, just where the beach and dunes bend to the east. In the distance Colonsay on the left and Mull behind on the right. As usual I will post a larger version of the picture on the photoblog on Saturday morning. And then find another topic. Two options I can think of, going even further north or travelling quite a bit south, although not all the way. Both would be from the walking week. Any preferences feel free to post them in the comments. Have a great (bank holiday if applicable) weekend!